Conway, SC.- Lucian Dal Wright Jr., 87, passed away Thursday, April 04, 2019 at his home surrounded by his loving family. The family will receive friends Saturday, April 06, 2019 from 6 until 8 p.m. at Goldfinch Funeral Home, 606 Beaty Street in Conway, South Carolina. A graveside service will be held Monday, April 08, 2019 at 11 a.m. at Memorial Primitive Baptist Church Cemetery in Fremont, North Carolina with military honors. Mr. Wright was born in Wayne County, NC on October 18, 1931 to the late Lucian Dal Wright Sr. and Lula Hill Wright. He was a Korean War veteran of the United States Army. 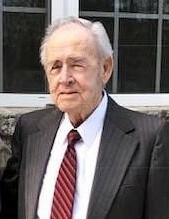 He is survived by his loving wife, Mary Frances Parrish Wright; one son, Lucian Dal Wright III and wife, Carolyn of Conway, South Carolina; three grandchildren, Stephanie Wright of Ohio, Jessica Gooding and husband, Ben of Columbia, South Carolina and Nicole Driscoll and husband, Mark of Richmond, Virginia and four great-grandchildren. The family is in the care of Shackleford-Howell Funeral Home, 102 North Pine Street in Fremont, North Carolina.